I love Tong Yuan. It may be just gooey glutinous rice balls but I just love the tasteless and the meaningless eating of it. I usually buy my Glutinous Rice Balls from the supermarket all frozen and all, but this time mum bought it from the wet market. SO we had hideous pink and white gooey glutinous rice mix. Now there are varieties with black bean and red bean and even with crushed peanuts. I have even heard of people putting kaya (coconut jam) into it… well I like mine plain, and nothing added. 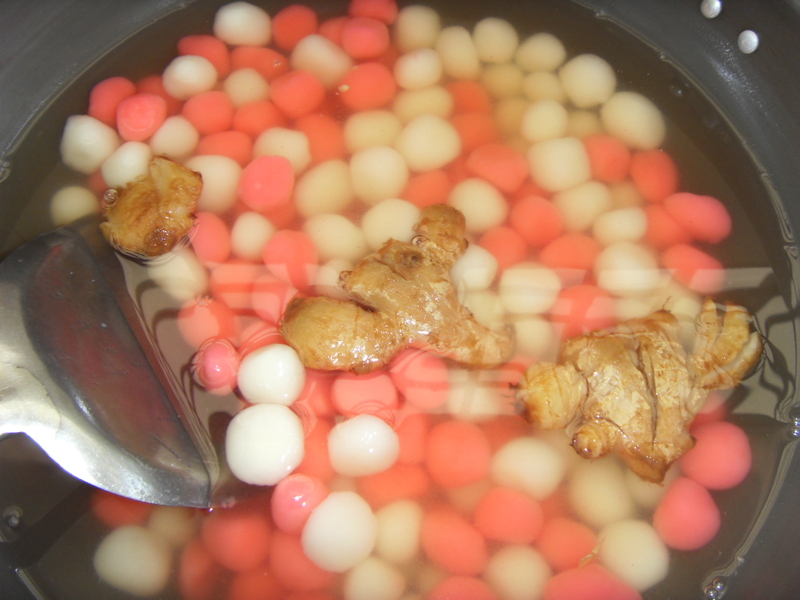 It is pretty easy to make actually, all you need is glutinous rice flour and water. Just mix it till you get the right consistency and there you have it. 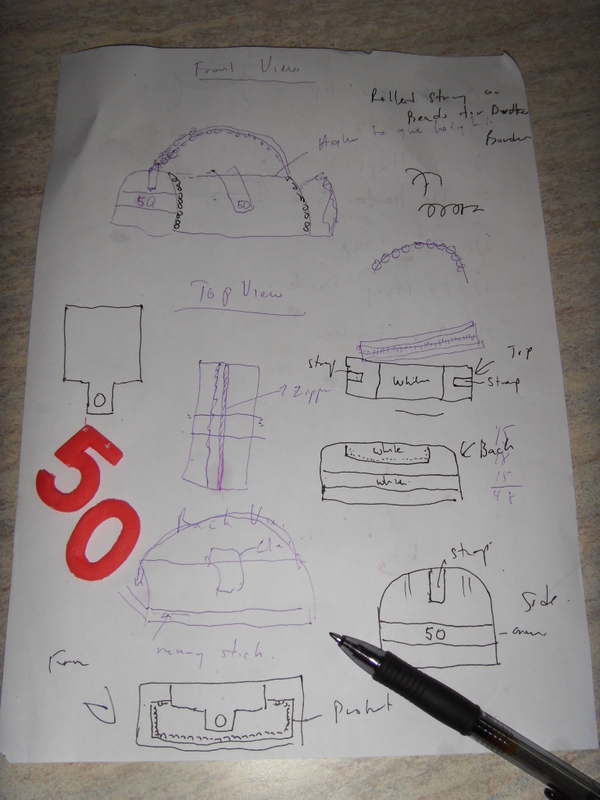 So here is my step by step making of Tong Yuan. All that jazz you see in the newspapers with families and neighborhood kids getting together and making the balls I reckon is all bogus and posed. Because my brother made about five balls and ran off and my mother who was the person who bought it made about twenty balls and declared she was hungry and went off for lunch. So in the end it was up to Eda and me to finish the job. First I boiled sugar syrup and a couple of piece of old ginger which I whacked a little. I left the syrup to boil for about 2 hours or so. The ginger is for heatiness to the body it being “winter” and all. For me I just love the taste of ginger in my drinks. I forgot to take the photo here. 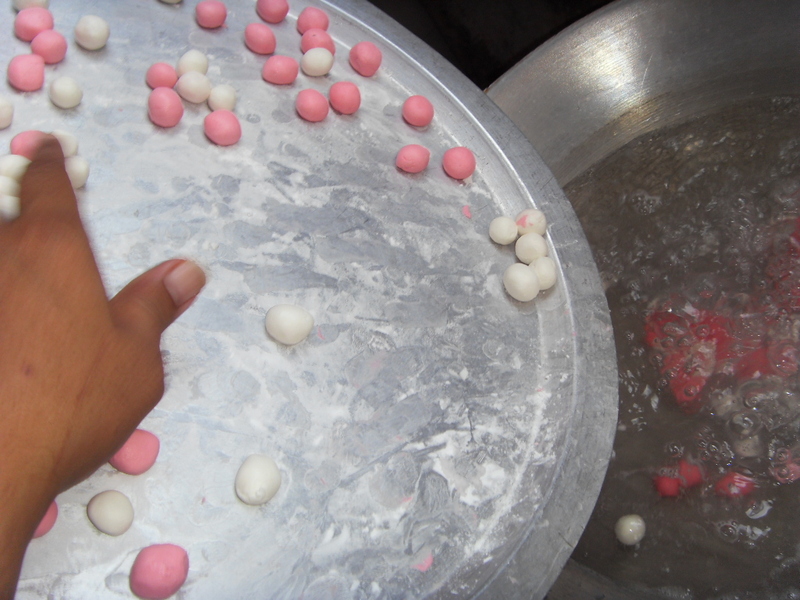 So you roll the balls and place it on a flat plate that is sprinkled with rice flour. Boil water, preferably in a big wok. I saw all these photos in the newspapers of families using small little pots and daintily straining the balls, well it did not happen in my house. 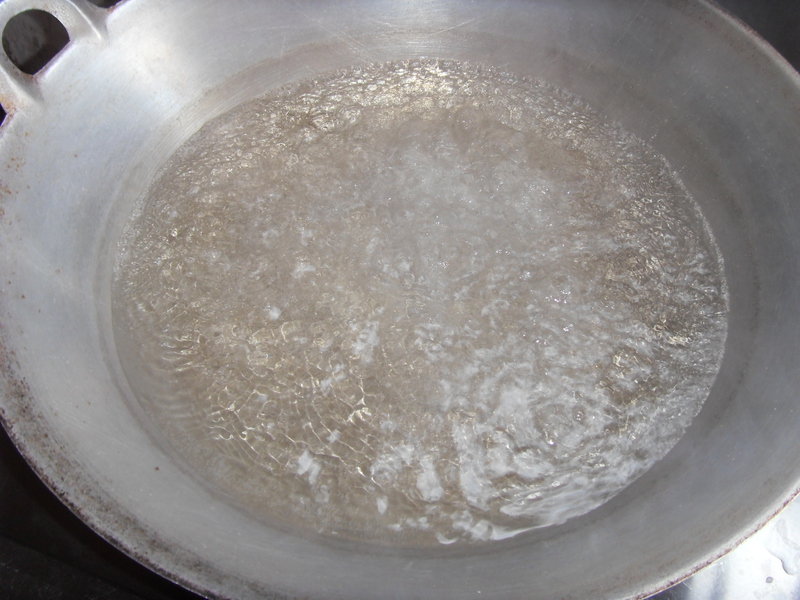 I boiled water in a big wok. I also had a big container of ice cube and water and so the fun began. 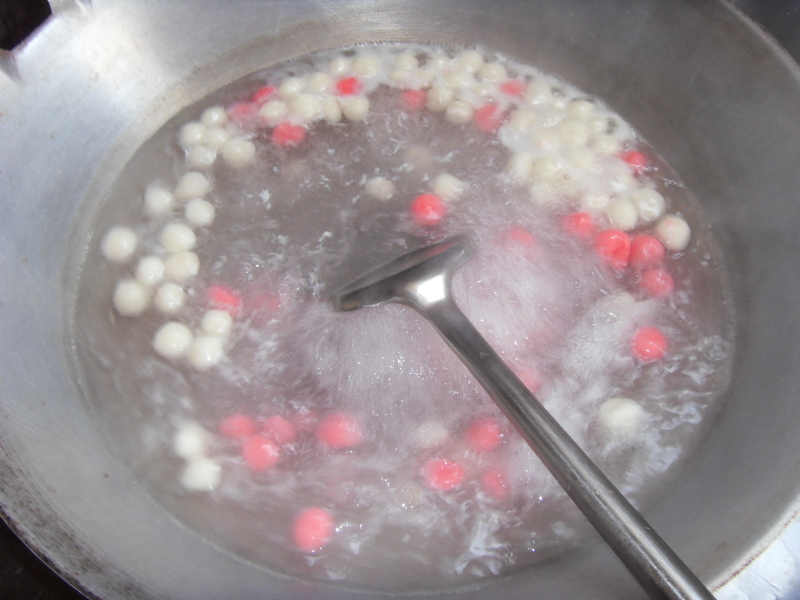 Pour the balls into the hot water and stir it with a frying spoon. Once the balls floats, just leave them for a few minutes, because the first lot I rushed and took it off as soon as they floated. Somehow it was not cooked too well, so leave it for about a minute of two. Once they all float remove them with the strainer. 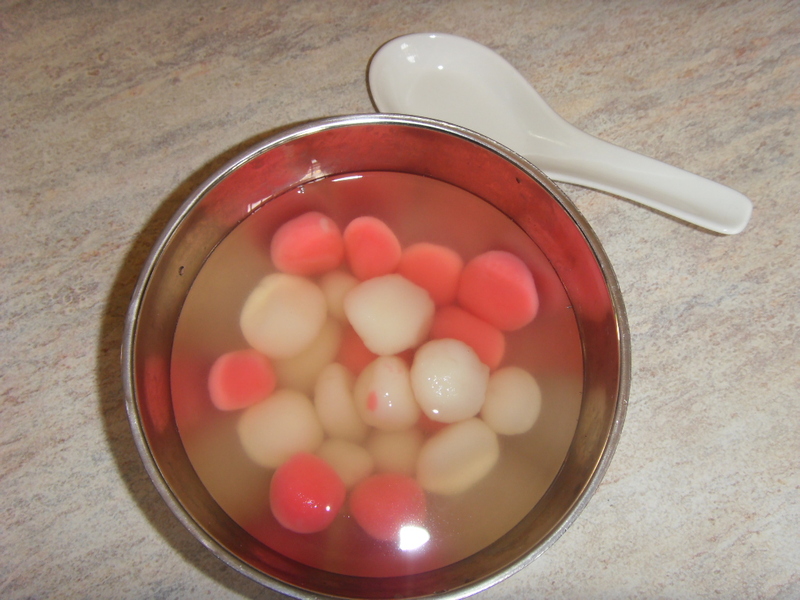 I removed the balls from the hot water and poured it into the ice cold water, to stop the cooking process. It worked out nice, could taste the balls almost instantly as well. 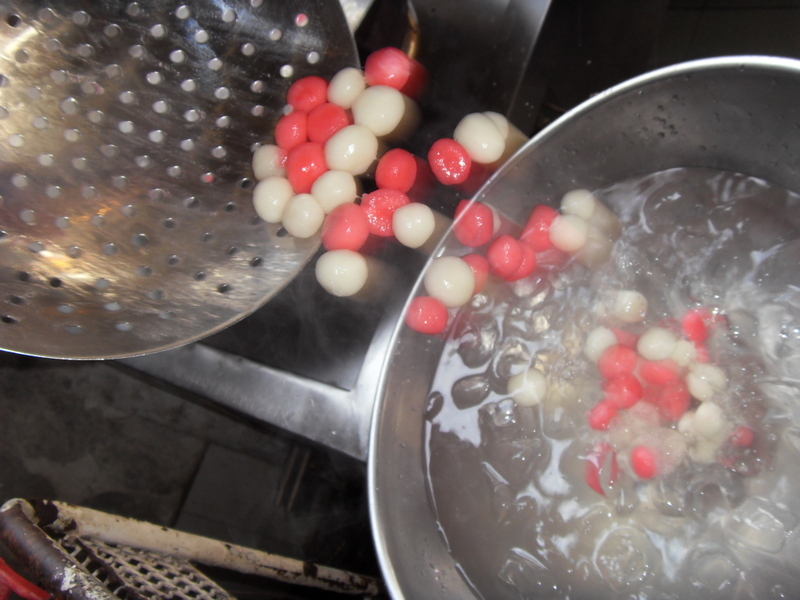 Once it was all done, I strained the balls and poured it into the sugar syrup which I just turned off to prevent further cooking. I just love it. I ate so much I felt like a big glutinous ball all day. 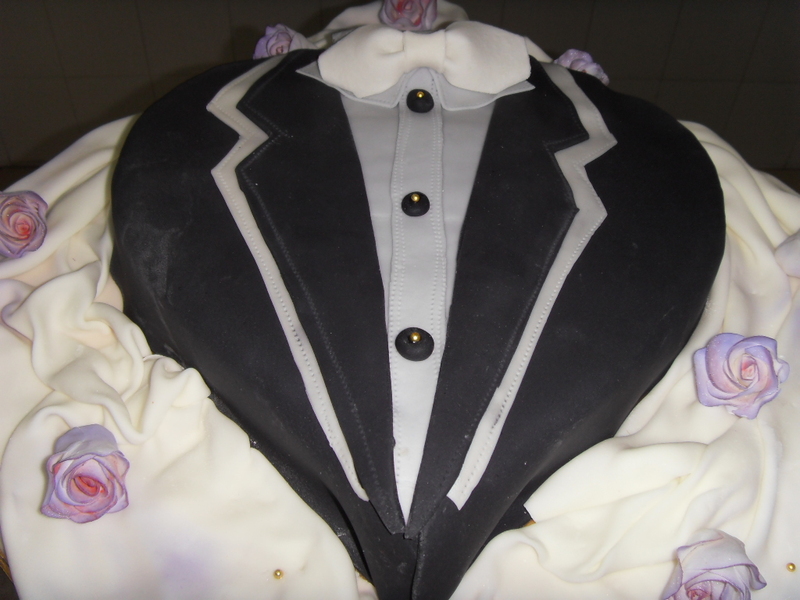 A Gentlemen’s Cake – Hafiq’s Handiwork! 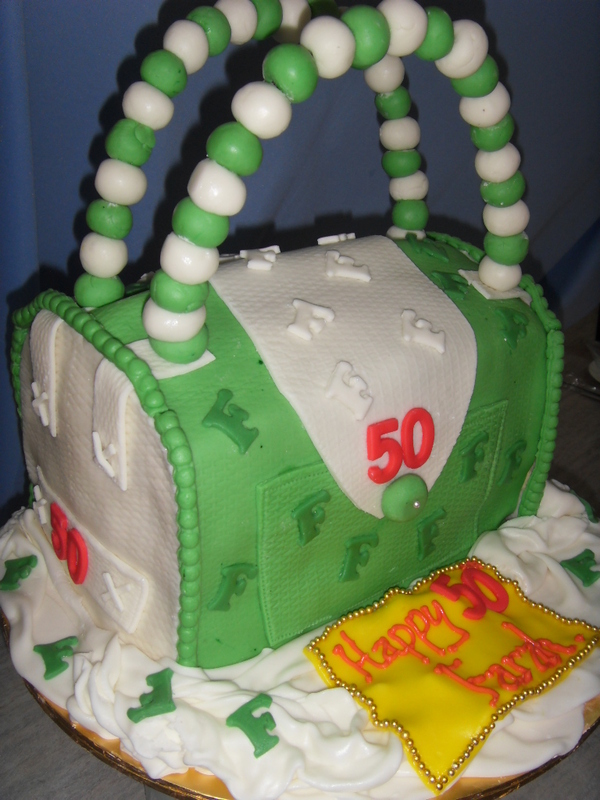 You know how hard it is to make cakes for men, and as they grow older it gets harder and harder. In fact I think making a cake for a guy is most stressful. Well we found a perfect solution for Bloke Cakes. This is Hafiq’s first foray into cake decorating and he did a mighty good job with it. 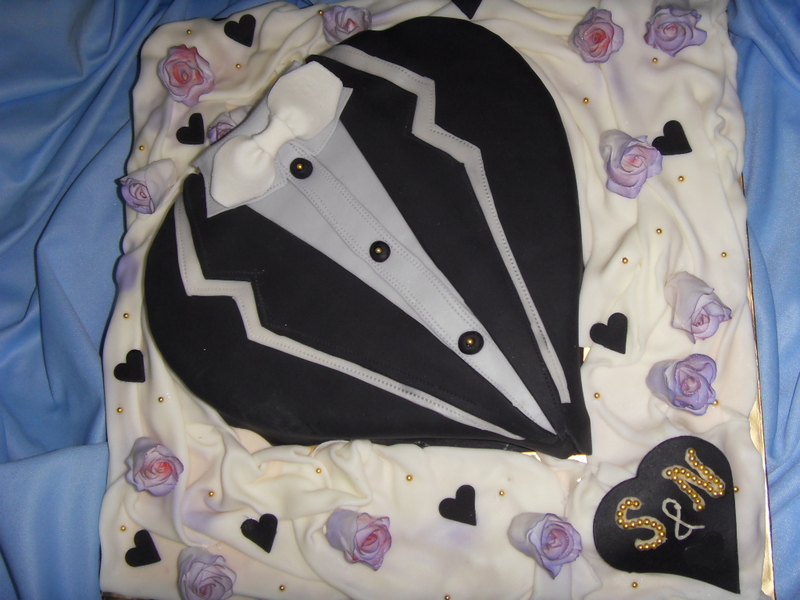 The cake was a Hantaran cake for his sister’s engagement and I am sure in the beginning she would have had butterflies in her stomach as Hafiq has never made a cake in his life and then he produced this. I think it is work of art. And by the way the flowers are hand made as well. He took two days to make those flowers and trust me it was a lot of work. Gum Paste is not easy to work with as he found out with our constant temperature changes we had during the weekend. added the details to it. So anyone need a Bloke Cake, well here is out first and there will be many more Bloke Cakes to come. The last two days have been rather daunting. I took an order that I was quite close to giving up because I had never done this sort of cake before. And after a rather hectic and stressful week last week and the weekend as well I might add, I thought enough was enough, but since I took the order and it was for one of my best clients I could not day no. 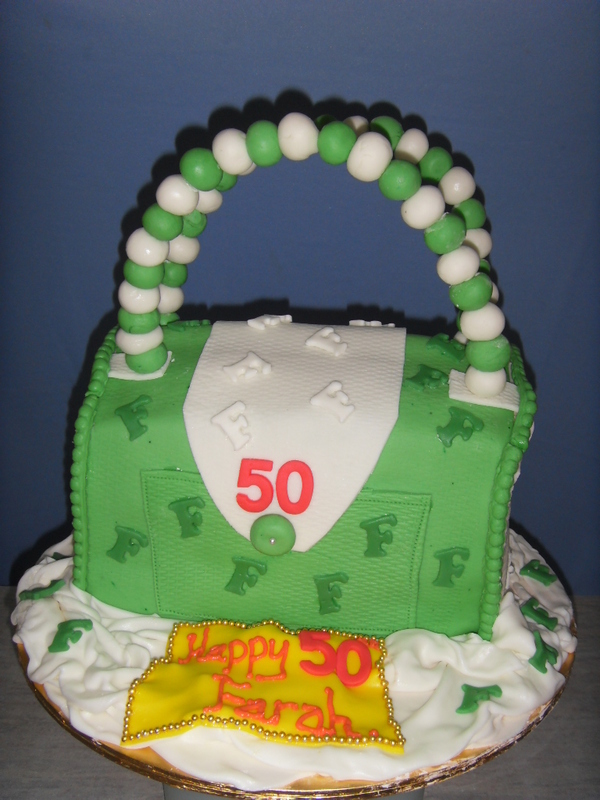 So I made my first HANDBAG CAKE!!!!! stuff that would take days to do and I had Monday to bake the cakes and Tuesday to ice it, so there was no mucking around and thinking of anything fancy mancy! 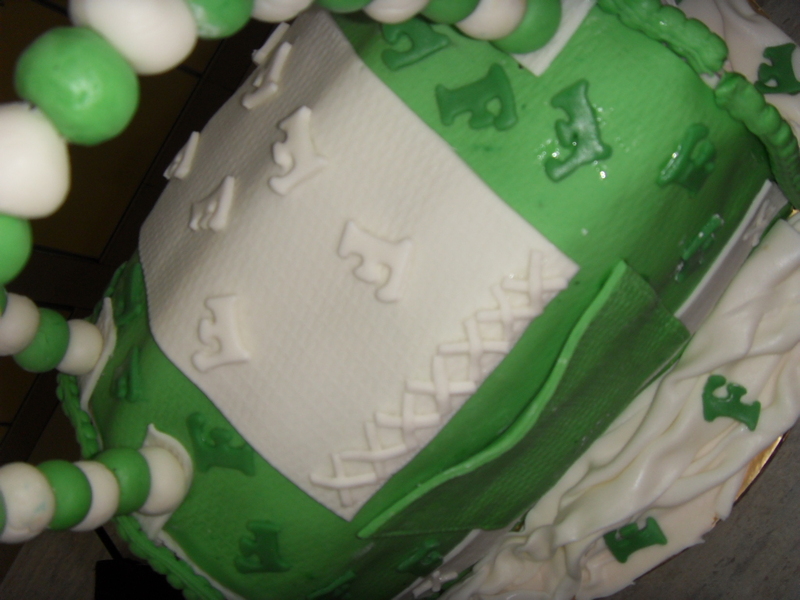 I had to make it high and so I had to make sure the cake was “strong” enough to take the other cakes weight. I could have used fruit cake, but that would be too expensive and not many people like fruit cake although Farah does like it I know. So I piled on 3 layers of Nutty Carrot Cake and on top I put an Orange Butter Cake, so cake alone it was 5 kilos already. I sandwiched it with cream cheese frosting and then covered it with butter icing, and then proceeded to cover it with fondant. And last night, I swear the cake looked like a something from Hansel and Gretel gone wrong. It was hideous. I gave up at 10.30 pm and went to bed. And trust me it was not easy going to bed with things on your mind. I did have things in mind the next morning, that I thought thru the last night and I actually did an Emmanuel Stroobant and drew everything on a piece of paper, step by step, because this is almost like constructing the real thing. So, I started again, with paper in hand and adding bits and pieces and three hours later. This is my cake. It does need a little bit of changes but for my first time, I think I can do it better next time. I chose not to use any designer names or logos because to me without making a big thing about it, it is an infringement of a brand, so I will not do such things as I am very against things like this. So this is Nicholas Pillai Design. now Mrs Elaine Kathleen Foenander watches over me. Even when I was young and quite hopeless she always gave me extra and taught me more then she did with the other ladies, I never knew why she’d take the pains to do so for this big fat kid who asked a lot of questions. So this goes out to Mrs Foenander! It’s not the best, but it will get better…..